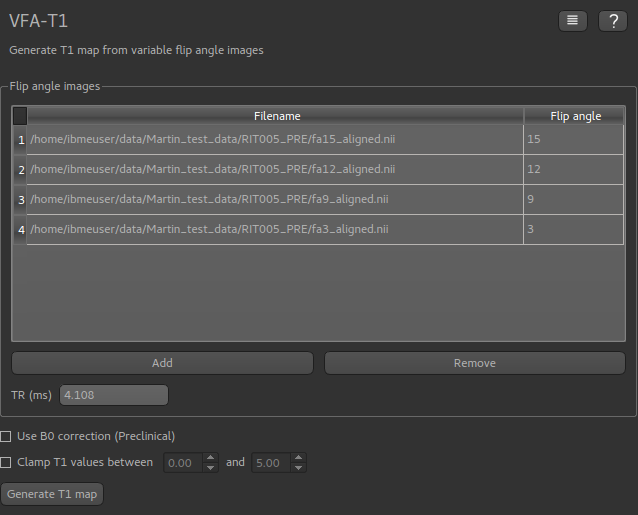 This widget generates T1 maps from variable flip angle images. This is often used as a preprocessing step for kinetic modelling. The VFA scans can be loaded either as separate volumes, one for each flip angle, or a single multi-volume file containing all the flip angles. The main VFA method is described in . Click Add to and select the data file containing the VFA images. You will then need to enter the flip angles as a comma separated list which must match the number of volumes in the data set. 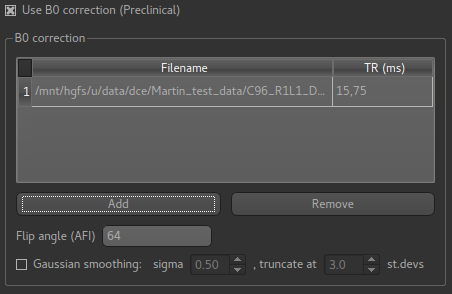 These are loaded in the same way as the VFA data described above, however in this case you must enter the TR value for each file in ms (or a sequence of TR values if the AFI data is stored in a single 4D data set). The flip angle used for the AFI sequence is also required. An optional postprocessing step is to apply smoothing to the output T1 map. The sigma value is standard deviation of the Gaussian used as the smoothing kernel, and is measured in voxels. The Processing->Smoothing widget can also be used to apply smoothing to the output. This allows the kernel size to be specified in physical units (mm). The output T1 values may be clamped between limits if required - this may be useful to eliminate unrealistic values in a small number of voxels.